Having it all in the travel world is a tall order. But that's exactly what the Sabre Red Workspace does - gives you everything you need to do your job. The Red Workspace is an easy-to-use, configurable agent workspace that provides unprecedented flexibility. All of your travel reservations and management needs are delivered directly into your workflow. The Red Workspace truly is your one-stop shop. CUSTOMIZE THE WORKSPACE to meet your unique needs and control configurations across the agency for optimal efficiency. OFFER YOUR TRAVELERS MORE with Custom Offers from suppliers, plus rich content like 360-degree views. EXPAND THE CAPABILITIES of your workspace by integrating Red Apps from a range of developers. EMPOWER AGENTS with all the capabilities they need to efficiently deliver great service. STREAMLINE CUSTOMER COMMUNICATION with professionally-formatted air, car and hotel itinerary options emailed directly within the workflow. MANAGE WORKSPACE CONFIGURATION across the agency by group or individually via the administration tool. EXTEND YOUR WORKSPACE through the world of innovations provided by Red Apps. REDUCE TRAINING time through the use of simple, yet powerful, graphical workflow capabilities. CONFIGURE TO BEST MEET THE NEEDS of each user. Administrators can adapt universally for optimal agency consistency. They can also control with tools and features are available for each user. CHOOSE YOUR OWN WORKFLOW between a traditional and format-driven workflow and one with enhanced graphical capabilities - or a hybrid of the two. Save time with a fully graphical, keyboard-driven workflow. Book air, car and hotel through an enhanced display. Shop using a low fare calendar matrix for flexible dates. Search for non/off airport locations for car bookings. Or an agent favorite: email travel itinerary options right within the workflows. 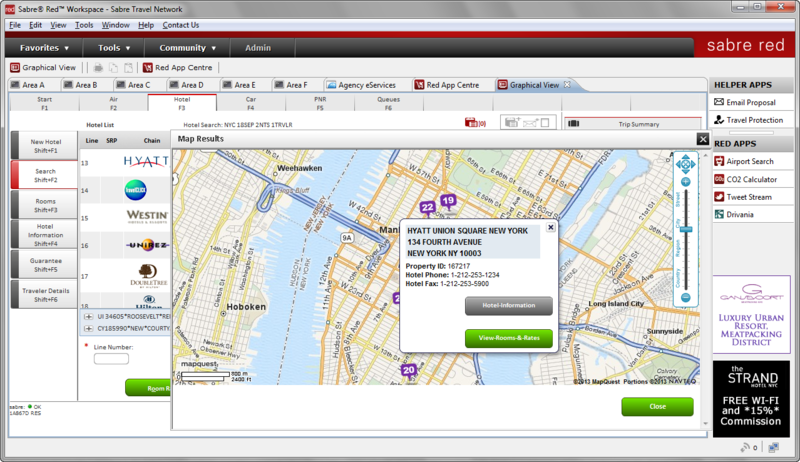 ACCESS ALL YOUR TRAVEL INFORMATION SOURCES, including the Sabre travel marketplace, in the Red Workspace. And the power of the Red Workspace can be extended by adding Red Apps from developers around the world. In our graphical view, find hotels on maps according to proximity to specific locations.